I met my brother Jake at the GSL Marina yesterday evening for a swim. It was a beautiful day and the lake was very calm with hardly any wind. There were several sail boats out on the water and a couple tourists wandering around. It took us a while to get in the water. My family came out to watch us swim and to help keep an eye on my boys. I didn't put my thermometer in, but the water felt really nice. I am guessing it was in the low 60's. Can anyone explain to me why salt water feels warmer than freshwater? I swam in 62 degree water at Sand Hollow last week and it felt much colder than GSL. We decided to swim from the marina to Black Rock and back which ended up being 2.5 miles. There were a couple cold spots, but the water was very comfortable. The water level keeps creeping up with all the late snow melt. I am keeping my fingers crossed that the water temperature doesn't cool down too much before the Great Salt Lake Open Water Swim with all the runoff. When we got to Black Rock, there were a bunch of people there. Some where shooting a gun (is that even legal?) and there were some kids messing around on the rocks. They must have thought we were crazy. On the way back I ran into Dave Shearer, Great Salt Lake Harbor Master, near the marina. He was out on the State Parks boat with his dog. He asked how it was going and if the water was cold. I told him it felt great and kept going. Congrats to Jake for completing his longest open water swim! 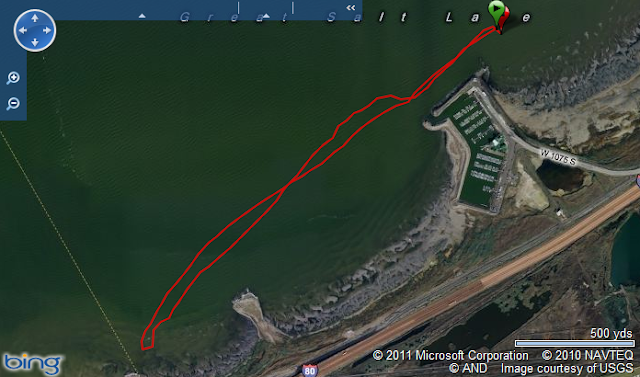 My dad got in the water the last two weeks and swam from the marina to the first green buoy and back. Way to go Dad! As I was finishing up the swim, my collar bone on my right side started hurting. This happened once before (at Slam the Dam last year) and I'm not sure what causes it. Anyone else out there had this same problem? It was a perfect day to be in the water and I had a lot of fun. I am getting excited for the Great Salt Lake Open Water Swim! We have been ordering medals, t-shirts and prizes this week. I am hoping we get a good weather day on June 11! Thanks to my family (Jod, B, Owen, Mom, Dad and Gram) for coming out to the lake to watch us and for keeping my boys safe while I swam. You guys are awesome!